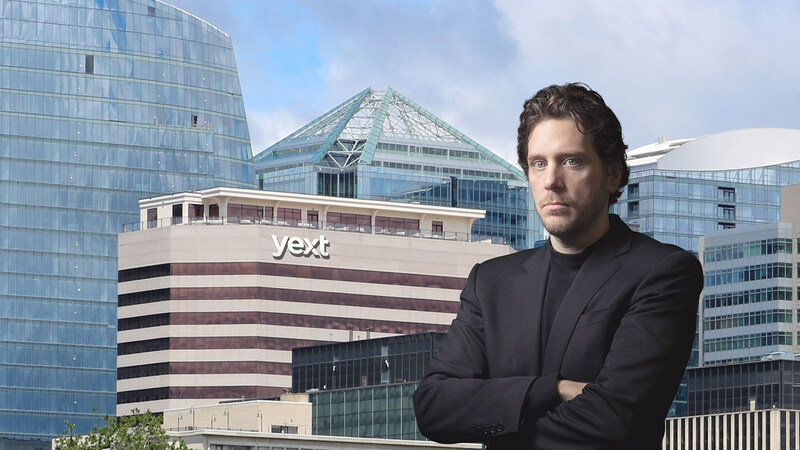 Yext Founder and CEO Howard Lerman in front of an artist's rendering. | Photo courtesy Yext. New York-based technology company Yext has announced plans to establish an office in Arlington County. The move will create 500 jobs over five years. Yext helps companies manage information about their brand across different platforms, including computers, smart phones and smart speakers. The company, for example, integrates with the Amazon Alexa virtual assistant, so if someone asks Alexa for information, those facts are powered by Yext. Yext’s office will be located at 1101 Wilson Boulevard, situated on the Rosslyn Metro stop. The company will occupy a 42,500-square-foot space, including three floors and a roof terrace. The open floor space includes a gym, bike storage, a lounge, onsite market and a cafe. Howard Lerman, Yext Founder and CEO, is a graduate of Thomas Jefferson High School for Science and Technology in Alexandria. Eighteen other employees also attended Thomas Jefferson.